These days computers are required in all the domains, I guess. Of course, computers would also be welcome in uncomfortable conditions, to put it mildly. 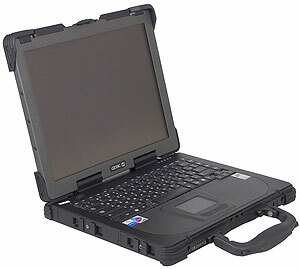 Rugged notebooks are designed for various emergency services, scientific expeditions, the army, as well as extreme sportsmen. 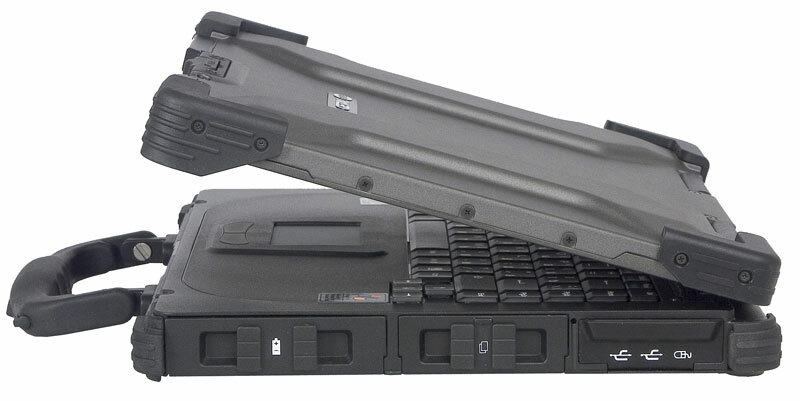 Our readers may have already read the review of such a notebook from Panasonic. 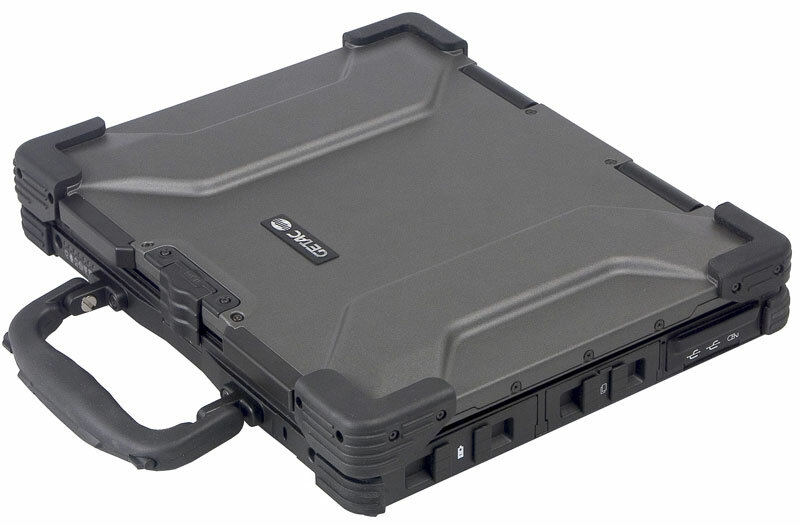 Today we are going to review a product from one of the most famous manufacturers of rugged notebooks - Mitac, who sells its products under the Getac trademark. 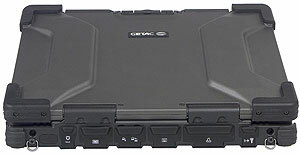 Getac M 220 is certified to conform with military (810F, 461E) as well as industrial (IP54) environmental standards. 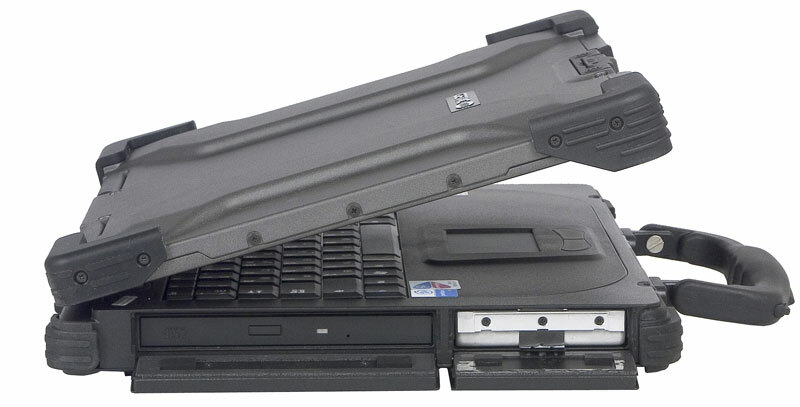 Official web site publishes environmental conditions, in which these notebooks can operate. 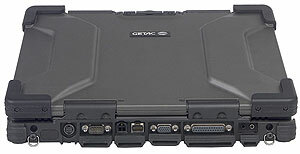 For all this, Getac M220 is quite a modern computer, just have a look at its specifications. It's a pity our sample was not equipped with all optional accessories - it would have been an impressive device. But even in its minimal configuration, Getac M220 can solve almost a full range of tasks, except for 3D graphics processing. The list of additional accessories for this model looks impressive. 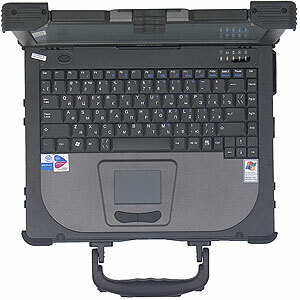 Besides various components, it includes everything necessary to install the notebook in a car. The notebook exterior is very impressive. It would blend in with a semi sci-fi action movie like Mission Impossible N+1. 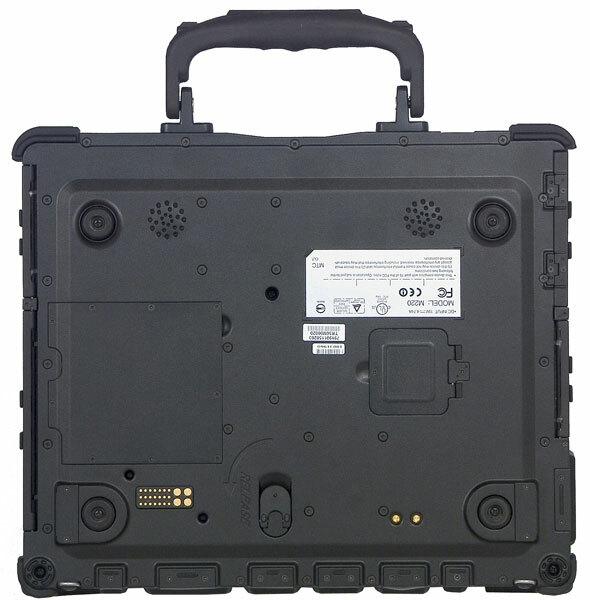 The case produces an impression of reliability and solidity. 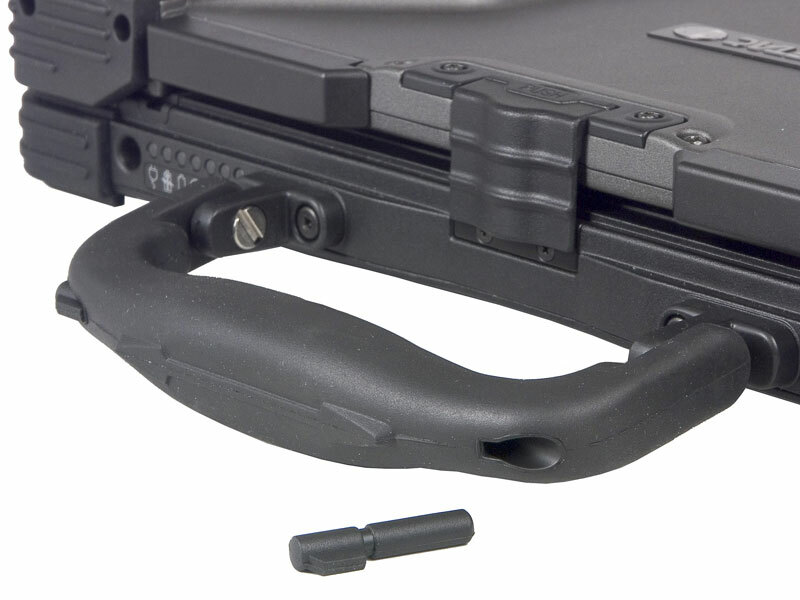 All connectors and removable devices are covered with rubber seals. The left flank houses an optical drive (an additional battery may be installed into this bay) and a HDD bay. The front panel houses a block of indicators, a handle, a display lid latch, and a Kensington lock hole. There is a stylus bay in the handle, in our case it was just covered with a stub. a docking port, a memory bay, and speakers. 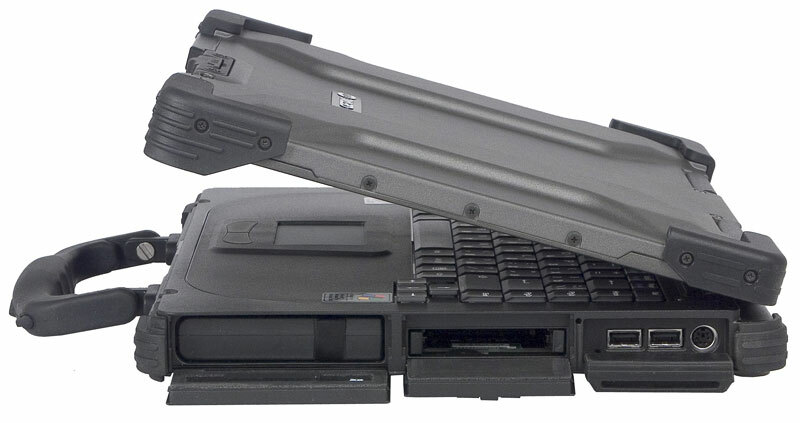 When you open this notebook, it also produces a comforting impression of a well-built device. Power button stroke is rather long, but that's not a problem here. But the long stroke of touch-pad buttons is really irritating. You cannot press these buttons quickly, without distracting from your work. 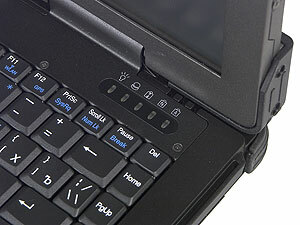 In fact, pressing a touch-pad button becomes a task in itself, so you naturally try to avoid using them. Perhaps, such a long stroke is intended to avoid accidental presses in rugged conditions (for example, being jolted in a car), but it's really annoying in normal conditions. Fortunately, we had no gripes with the touch-pad itself and the keyboard. The only thing we didn't like in this keyboard layout is a small Enter. Indicators are divided into two groups. The front panel houses status lights for AC power and battery, battery charge, wireless and wireline network activity, wireless modem activity (if installed), and optical drive activity. 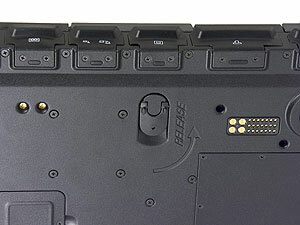 Notebook status, HDD, and Lock indicators are located above the keyboard on the right. It should be noted that designers paid attention not only to operation in extreme conditions, but also to protection of data from unauthorized users. This notebook uses total encryption of its hard drive (including the boot sector) on the BIOS level. The encryption option must be enabled BEFORE formatting the hard drive. After that, each time the notebook boots up, it prompts for password. If you forget the password, all your data is lost. 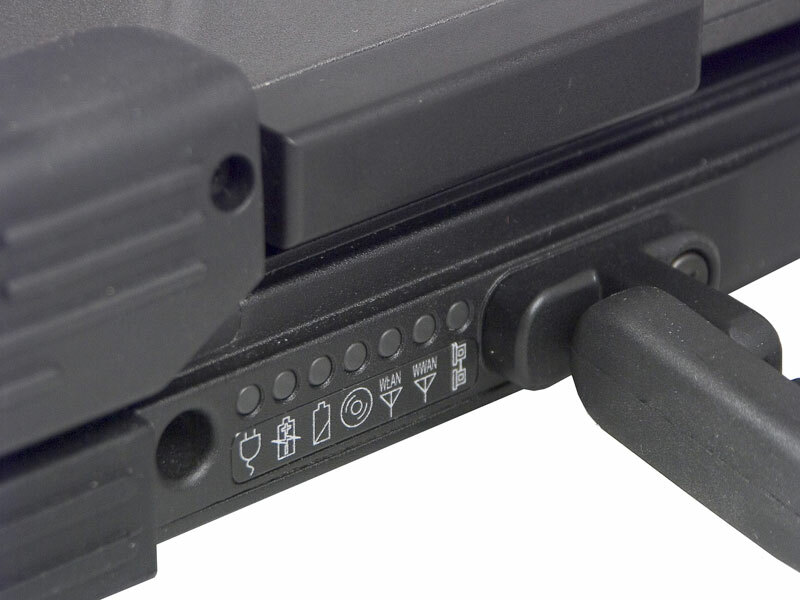 We haven't carried out survival tests, but one thing put us on guard: the battery bay lid would sometimes open on its own will. Of course, the seal will get ground in time, but at first you should pay attention to the covers. It was very interesting to see the effect of the protective coating on the display properties. Colors seemed to be faded compared to regular panels. You can look at the complete instrumental test results here, the main results are published in the table. 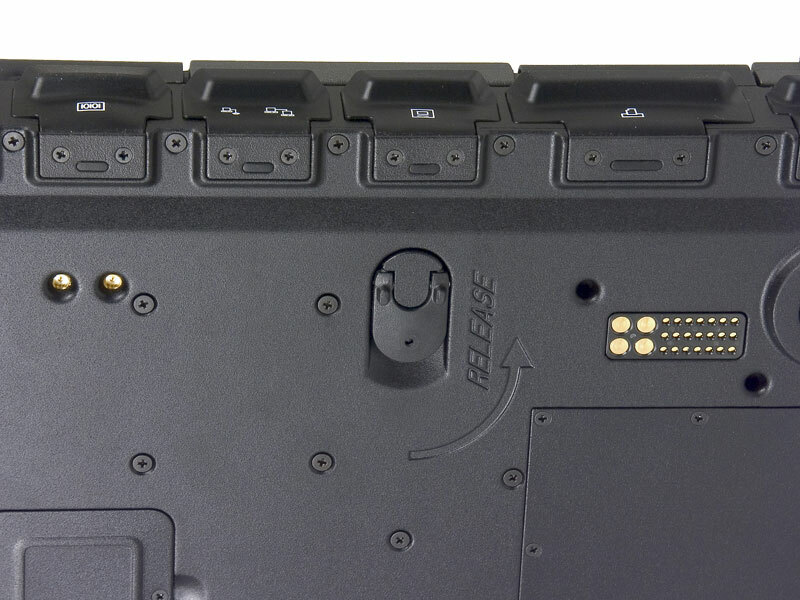 In other words, this panel offers good brightness and contrast, as well as high uniformity of white and black spot brightness. Black spot luminance is a tad too high, but it's not critical for this model, I think. But the angles of view are too small - that's the effect of the protective coating. One year warranty for the entire bundle. You cannot expect record-breaking performance from a notebook with a low-voltage processor and integrated video, so we just publish the results. They are not very high for these day, but absolutely natural for this CPU clock. It's certainly a notebook for a specific niche. You will hardly spend extra money just to show off an original design. It's quite possible that potential buyers have totally different criteria. 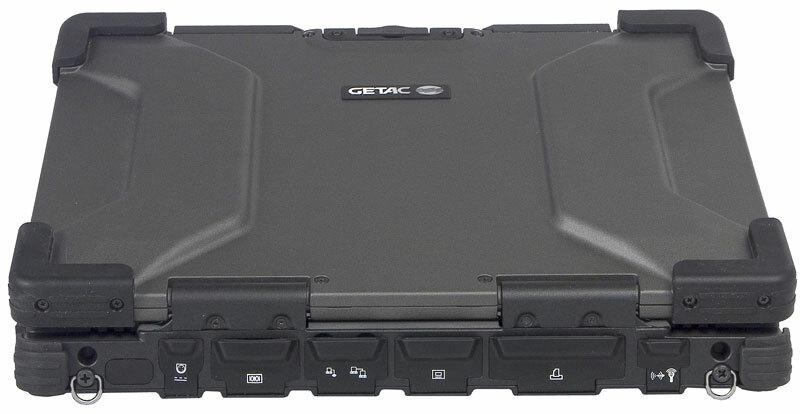 Nevertheless, I think our readers will have interesting time getting acquainted with Getac M220.